Use TAG-Connect® to upgrade projects with new firmware for all Microchip microcontrollers using the ICSP ports. 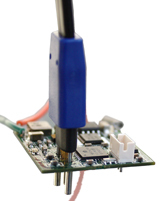 Keeps required re-programming board space to a minimum, no additional components necessary. 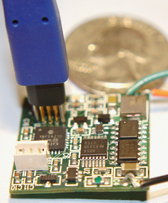 Can be used with MPLAB for debugging microcontrollers with the debug engine on-chip. Keep your product up-to-date with your latest product firmware - just connect to your ICD2 or ICD3 or PICKit3 (and RJ12 adaptor). 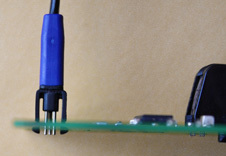 Simply apply power to your product, push the TAG-Conenct on to the PCB and use MPLAB to program. 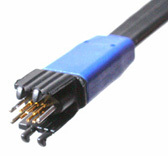 Available with a 150cm fly-lead in either standard (no legs) or with clip legs.